The field of cosmetic surgery has increased at an exponential rate over the past several decades. Many paradigm shifts have occurred and this has changed the entire landscape of aesthetic surgery. If a practitioner that performed aesthetic surgery procedures 40 years ago were to spend a day in my office they would be amazed by the new changes and technology. Botox, lasers, endoscopic surgery, injectable fillers are just a few of the changes that have improved the profession. Also among the changes is the fact that numerous specialties include aesthetic surgery in their core curriculum. These procedures are taught in most residency programs to ophthalmologists, dermatologists, ENT docs, plastic surgeons, oral and maxillofacial surgeons and gynecologists to name a few. In most of these specialties, cosmetic surgery procedures are part of the resident’s training, they are part of the board exams for those specialties and they are covered under the malpractice policies for those specialties. Contemporary educators will freely admit that aesthetic surgery is well within the accepted scope of numerous specialties. No single specialty owns the body or the face and each of these specialties have brought advancements to the collective table of aesthetic surgery. For instance, dermatologists pioneered laser surgery and invented tumescent liposuction. The current American Society of Plastic and Reconstructive Surgeons were originally founded by oral surgeons and physicians and was called the American Society of Oral Surgeons until 1931. Oral and maxillofacial surgeons also made significant advanced in aesthetic skeletal surgery and facial implants. 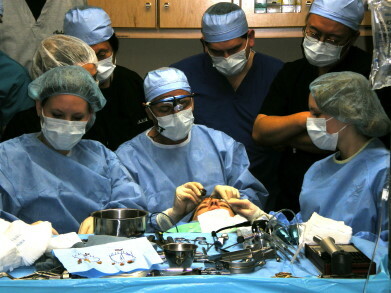 Ophthalmologists have contributed many techniques for cosmetic eyelid surgery and gynecologists have introduced or improved cosmetic vaginal surgery. ENT physicians have advanced the field of cosmetic nose surgery on a continual basis. The list goes on and anyone that disagrees with the fact that contemporary aesthetic surgery is a multispecialty realm simply has their head in the sand or has intentions of secondary gain, such as limiting the competition, turf battles, and the desire to control patients and dollars. So…what is “plastic surgery” and how does it differ from “aesthetic surgery” or “cosmetic surgery”? 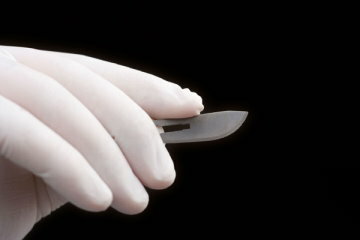 A Plastic Surgeon is a noun (or could be an adjective) that describes a surgical specialty of medicine. When used as to describe a type of surgery it has a much broader definition. Any surgery that is intended to improve form, replace or restore missing or damaged tissue can also be called “plastic surgery”. So, having said that, if one calls them self a plastic surgeon, it should indicate that they performed a general surgery residency and then a plastic surgery residency and they would be considered a plastic surgeon. There are, however, exceptions. Otolaryngologists (ENT’s) changed the name of their specialty to “facial plastic surgery” and ophthalmologists developed a specialty designation of “oculoplastic surgery”. These practitioners often refer to themselves as “plastic surgeons”. Other specialties will surely follow this lead in the future to represent their contemporary scope. In my situation, I am a board certified oral and maxillofacial surgeon. I am very proud of my unique qualifications to provide aesthetic facial surgery. My early dental training (I never practiced general dentistry, but had to have a dental degree to enter a maxillofacial surgery residency) gave me excellent dexterity and artistic perspective as well as four years of studying facial anatomy. My oral and maxillofacial surgery residency provided me not only with medical and surgical training, but also with an unparalleled level of head and neck anatomy and expertise in that region. I feel that my specialty has an intense level of head and neck training (if not more) than any specialty. As with any specialty, a surgeon can decide to focus on specific areas that he or she likes to do or excels in. My true love is cosmetic facial surgery and over the years it became a bigger and bigger part of my practice and in 2004, I limited my practice to only cosmetic facial surgery. If a doctor does nothing but cosmetic facial surgery then I believe it is practical to refer to them as a cosmetic facial surgeon. In reality, it is not about the specialty, it is about one’s training and expertise in what they do. A poor cosmetic surgeon does not stay in business long regardless of the specialty. Why don’t I want to be referred to as a plastic surgeon? The reason is simple. Number one, that is not my specialty and I have no need to feign credentials. Number two and most important, I limit my practice to cosmetic facial surgery and “plastic surgery” is not necessarily cosmetic surgery, so if I did attempt to call myself a plastic surgeon, it would be detrimental to my practice as it would indicate that I do not spend 100% of my time doing cosmetic facial surgery. The third reason that I do not want to be called a plastic surgeon is that I have many plastic surgery friends on a local, national and international level and it would be an affront to them and their training. Most plastic surgeons are pretty sharp people and do some amazing reconstructive procedures all over the body, but having that specialty designation does not automatically imply proficiency in aesthetic surgery. The real bottom line is that numerous specialties perform competent and safe cosmetic surgery. That can’t be disputed. Some competitive practitioners who are still fighting the worn out turf battles will attempt to say that other specialties have more complications, but again, the people that usually are saying this are the ones with the most complications. So, I am not a plastic surgeon, but no one can dispute that my practice is limited exclusively to cosmetic plastic surgery procedures of the head and neck. I am quite happy and secure being a board certified oral and maxillofacial surgeon and a DMD that only does cosmetic facial surgery. It is very difficult for any practitioner of any specialty to limit their practice solely to cosmetic surgery and very few ever get to that point. It is even more difficult to limit a practice to cosmetic procedures of the face and neck because not doing body surgery significantly reduces available surgical options. I am proud to be one of the few surgeons of any specialty in my state to have a practice limited to cosmetic facial surgery, as well as one of the busiest. I am also proud to be a fellow of the American Academy of Cosmetic Surgery and the American Society of Laser Medicine and Surgery. I am proud to have published and lectured on cosmetic surgery more in the last decade than most of my naysayers will in their lifetime. I am proud of my most recent textbook, which has set sales records and has sold well to all the recognized cosmetic specialties. Cosmetic facial surgery is my passion, my life’s work, my job and my hobby. I teach cosmetic facial surgery (to all specialties including plastic surgeons) at over 20 venues a year. This sounds like bragging, but it isn’t; instead it is passion. I love cosmetic surgery, I love going to work, I love the patients and I love operating. Finally, this is how I feed my family and take care of the numerous expenses required by being the father of two severely handicapped children. This I take the most seriously. I do what I do well. It is not a problem to call me a cosmetic facial surgeon because all I do, all day; every day is cosmetic facial surgery. But please don’t call me a plastic surgeon. It does not accurately describe a practice that exclusively performs cosmetic surgery. I had an interesting experience at the office today. Not my first of this type, but a good one. I went to a treatment room to see a patient that I have treated many times for Botox and small procedures. I noticed that she would not make eye contact with me and thought that was odd. I asked her how her summer was and she said “terrible”, again while staring at the floor. When I asked her why, she said she made a terrible mistake. She went on to explain that she had consulted me months ago about a facelift, but on the recommendation of a friend, went to another surgeon and the result was a disaster. I held her hand and reassured her that I am not offended and this happens to all doctors but I was sorry about her result. Upon examination, she was correct, she had a poor surgical result. Her incisions were improperly placed and noticeable, her neck still had much laxity, she had lost areas of tissue that healed with scars and had folds on her neck and chin from improper technique, to name the major problems. She began crying and said she wanted to sue the other doctor. I asked her who the other surgeon was and she told me. She also told me that she should have know better than to go to him because when she told him that she had also consulted me, he “went off”. She said this surgeon went into an embarrassing 5 minute diatribe about how I am unqualified to perform her facelift and many other degrading things about me. She said that she already had paid a deposit and signed some papers so against her feelings she went ahead with the surgery. She explained how disappointed she was and how much she suffered and how it ruined her entire summer. She also reminded me that she asked me one time about this surgeon and I did not say anything negative about him and after his assault on me, she now sees the value of being a bigger person. She stated “wow, you must really have taken a lot of this surgeons business for him to be that jealous, I am so sorry I did not choose you to begin with.” This was a good reminder of how astute patients really are. I again told her not to feel bad and that her actions were in the past and she can’t change that. She spoke about suing the other surgeon which I totally discouraged, knowing that if the shoe was on the other foot, he would have relished in the process. We began working on the scars and made a treatment plan to deal with the other problems and upon leaving, she gave me a hug. I hope a lot of younger surgeons see this blog as there are a multitude of lessons to be learned in a case like this. First of all, always speak with purpose and never lower yourself to the level of negative, insecure people. You will always look bigger and patients can see right through an insecure surgeon. Secondly, many doctors are victims of “competitive insecure bashing” and they should never let that bother them. If a surgeon treats his or her patients like family and does good work, it will all catch up with the good doc and take away from the bad doc. A Chinese proverb says “if you sit by the river bank long enough, you will eventually see the bodies of your enemies float by”. It’s true. Most doctors that talk trash are identifying themselves to that patient as insecure and intimidated by their competition. If you can’t say something positive, then simply say “I don’t know anything about him”. So today I wanted to thank Dr. X for his kind referral of this patient and all her friends. I actually received patients without any marketing. What goes around comes around. Only Use A Board Certified Plastic Surgeon?? It seems that cosmetic surgery is one of the most popular topics to read about these days. Pick up any magazine or paper and you will likely find an article on cosmetic facial surgery. Same goes for TV and radio; cosmetic surgery is a popular topic. We all know that there are a lot of different types of surgeons (and nonsurgeons) that perform cosmetic surgery. We all know that some of these docs are really good and others may not be so good. We also know that because of all of the many specialties that do cosmetic surgery that there is also a lot of competition among these groups. Knowing all of the above, the question frequently arises on how to pick a competent surgeon. Unfortunately, too often, you will read “only have cosmetic surgery from a board certified plastic surgeon”. Let’s think about this for a minute. It is like saying only buy a Lexus because it is the best car and all other cars are unsafe. We know that there are many safe cars and if one company says that theirs is the best, it does not mean that all other car companies are no good. With the transparency of this marketing hype it makes one wonder how the “only board certified plastic surgery thing” continue to be stated? It is obvious that it is false marketing by the plastic surgery organization. There is nothing wrong with them cheering for their team, but it is an opinion of their society, not a fact. I use the word false because there are not studies to support that ANY specialty of surgeon has better outcomes, happier patients, or fewer complications than another. 80% of cosmetic surgery is performed by non-plastic surgeons. Any organization or group can make statements to fool the public into thinking they are the best or the only choice. This is exactly what organized plastic surgery has done. I have many plastic surgery friends and colleagues and some of them received excellent training in cosmetic surgery and have great results. Others plastic surgery friends, received very little cosmetic training as plastic surgery is not cosmetic surgery so they spent their training learning about burns, reconstruction and other important procedures, but not cosmetic surgery. I have seen many outcomes from these people where the outcomes were not so great. It as a fallacy to think that plastic surgery is cosmetic surgery or that all plastic surgeons are good cosmetic surgeons. Simply not true. I have had numerous patients that came to my office because bought the hype of “only see a board certified plastic surgeon, and when they went there for treatment, it was done by a nurse!! Not that there are not competent nurses, but doesn’t that contradict the mantra? 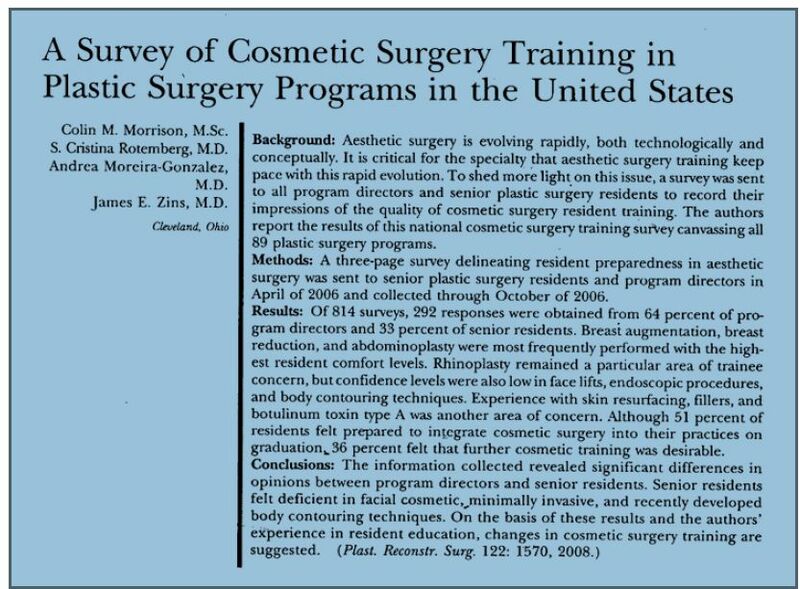 A recent in the Journal of Plastic and Reconsructive Surgery concluded that “Senior Residents (in Plastic Surery) felt deficient in facial cosmetic training” (see image below). The article goes on to describe the average minimum cosmetic surgery case requiements for plastic surgery programs is 7 facelifts, 8 eyelid surgeries, six nose surgeires and 10 breast implants (see image below). Obvisously, some residents get more training but the fact is that entering private practice with the experience of 7 facelifts or 8 eyelid surgeries does not make someone an expert or better than other specialties. Again, just because someone is a plastic surgeon does no make them better than another specialty. There are numerous specialties other than plastic surgery that perform safe and effective cosmetic surgery. These include dermatologists, oral and maxillofacial surgeons, ENT’s, ophthalmologists as well as other specialties. Given my personal training as an example, I have spent 10 years after college learning about the head and neck. My expertise is in head and neck surgery and I understand the face and have had as much (if not more) experience in facial surgery as any specialty that exists. I am also board certified in my specialty (oral and maxillofacial surgery) and limit my practice to cosmetic facial surgery. Having said this, does it make more sense to have a facelift from a board certified oral and maxillofacial surgeon that only does faces or a board certified plastic surgeon that may do a handful of facelifts a year, but performs hundreds of body procedures? I performed over 80 facelifts last year while the average plastic surgeon performs 26. This blog entry is not meant to discredit plastic surgery as it is an impressive specialty with many talented surgeons and I am friends with many of them. 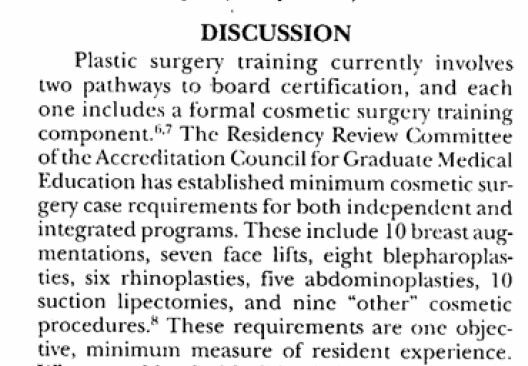 The only purpose of this discussion is to dispel the self-serving notion that patients should “only have plastic surgery from a board certified plastic surgeon” . This in untrue, unfounded, is not proven and only serves to fool the public. Who is a cosmetic surgeon? A cosmetic surgeon is a surgeon that limits his or her practice to cosmetic surgery. It does not signify a specific specialty. What is most important here is the success of any surgeon from any specialty. That is measured very easily by looking for cosmetic surgeons with good outcomes, low complications, happy patients and a booming and successful practice. Looking for the aforementioned traits is a much better indicator for a good doc than buying into specialty marketing propaganda.